Rodent Control is a 3-step process: Inspection, Exclusion and ongoing periodic service. Omitting one of these three steps will increase the likelihood that you will have rodent re-infestations. Additionally we provide one more service, cleanout, to remediate the contaminated insulation often found in attics and crawlspaces. This filthy mess can carry potential disease pathogens, reduce the energy efficiency of your home’s insulation and potentially create a barrier to selling your home in the future. Our combined rodent service and cleanout service protects your home and health – read on to learn more! Rodents – both rats and mice – are aggressive, tenacious and secretive, and are often a community-wide problem. Even new homes are susceptible. So, first, you need a qualified and experienced inspector to determine details of infestation. What makes our inspections different than other services out there? Our thorough inspection usually takes a few hours, and identifies both “hot spots” (active areas) as well as “soft spots” – potential areas where the rodents will try to gain access next, once their active areas are sealed off. We diagram and review our findings with the homeowner, as well as set traps. Others may offer a “lower price” inspection – but be careful…in rodent control, cheaper is not better! Rodent access points that were identified during the inspection are repaired and sealed by our expert technicians. This includes work on the roof (at roof adjoinments & eaves), loose fitting doors, broken foundation vents, burrows in the soil or numerous other locations. Any “soft spot” locations are also addressed, and the traps set by the inspector are carefully checked, emptied and reset as needed. Even with the best rodent control for your home, the conditions in your greater neighborhood rarely change. Rodents are territorial and leave pheromone scent trails that can last for 6 months or more. So other rodents are attracted, especially with the defending population now eliminated. Adios Pest Control provides protection through ongoing periodic service that reduces the likelihood of rodents re-establishing in your home in the future. Rodents can create an astonishing amount of damage and contamination in a short period of time. Droppings, urine and carcasses and other contamination are filthy and could pose a health hazard. You don’t want these problems to appear on a home inspection when it comes time to sell your home in the future. Even if you aren’t selling your home, removing the contamination reduces the pheromone scent trail left behind as well as offending odors. 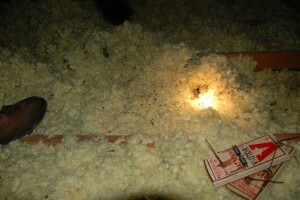 We remove the rodent droppings and other disgusting filth, and damaged insulation is removed & replaced. In most instances a new vapor barrier is installed, and we apply an organic deodorant and sanitizing solution in the crawlspace or attic. Rats and mice are filthy and seriously compromise your home’s hygiene. They also damage insulation, wiring, roofing & other parts of a home. The first step is having a qualified, experienced rodent technician carefully inspect your home exterior, nearby ground, crawlspace, attic, roofline, and also any suspect interior spaces. In this process rodent access points are found, as well as “soft spots” – those places on the home where rodents can easily push or gnaw through – are located. Both the active access points and the soft spots need be addressed because, as soon as we close the active access points rodents will certainly do everything in their power to regain entry. And they will certainly jump, climb, squeeze, tunnel and chew their way in again if any opportunity remains. The rodent inspector sets traps in strategic places to begin eliminating the population. Trapping at this stage is crucial (over baiting) so that dead rodents can be later found and removed without creating serious odor problems. Clean out (filth & damaged insulation extraction), Restoration (repairs & insulation re-installation) and Sanitization. Rodent Inspect and Protect service to protect your home’s future. dormer on roof found during roof line inspection. Safety hazard: damaged wiring from rodent gnawing revealed during attic inspection. Step 2 – Exclusion – Keeping rats out! At Adios Pest Control, we take pride in unraveling the mystery of where rodents are getting into your home. We use our extensive training in rat and mouse biology to think like a rat in order to catch a rat. Adios Pest Control’s combination of rodent expertise and construction repair specialists are what you need to solve this aspect of rodent infestation. Someplace, somewhere, there is a hole or crack or crevice that allows entry for rats or mice. Rodent control can’t be effective without sealing off these gaps. This work requires tedious attention to detail because their routes are often tricky to fully locate. This is where the art and science of Adios Pest Control’s rodent exclusion comes in. Rats and mice get into your home interior, attic, or crawlspace through entry points. Because their skulls are flexible they can get through tiny openings.